If you’re a newcomer to Florida and you love roses, we’ve got news for you: even in this state that’s most famous for its tropical foliage, you can grow roses. Many different kinds, in fact. You just have to know a little bit about what you’re doing. In this article we’ll talk about what kinds of roses do best in Florida, what to look for when you buy them, and how to plant them. When it comes to selecting the best roses to grow on your property, ask yourself how much time you want to spend caring for them. Some roses require low maintenance to look great and bloom well. Others require deadheading and regular pruning to look their best and produce great blooms. Low-maintenance roses—the ones best suited for the average busy homeowner—include varieties of shrub roses. These have casual, open blooms. Shrub roses include the popular Knockouts, plus Aloha, Belinda’s Dream, Carefree Beauty, Graham Thomas, David Austin, and Quietness roses. 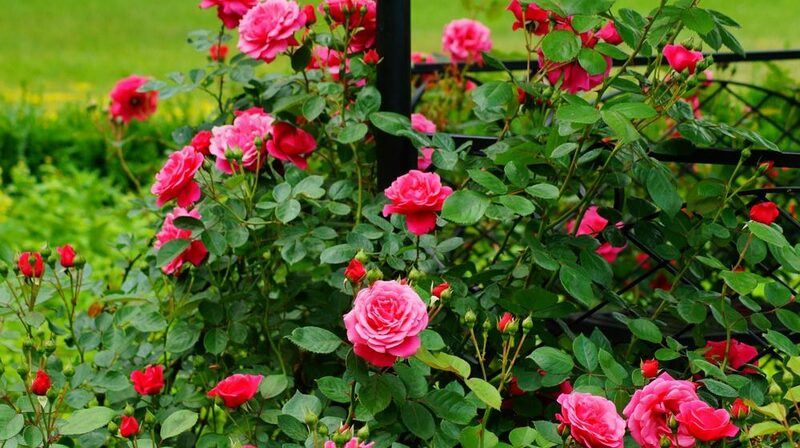 Climbing roses that grow on trellises or pergolas are also fairly easy to grow without a lot of maintenance. Roses that require more attention are the iconic kind bought from a florist or seen in wedding bouquets. These ones, with the classically-shaped, tight blooms, are the hybrid teas (Moonstone, Veterans’ Honor, Tiffany, and St. Patrick), grandifloras (Melody Parfumee), floribundas (First Kiss, Angel Face, Fabulous), and polyantha roses (Clotilde Sopuert, the Fairy, Gabrielle Privat, Cecile Brunner). They can be spectacular . . . and take a gardener’s time and effort to be so. Visit a garden center or your local nursery to purchase roses. You can also buy roses online and have them shipped to your doorstep. Local farmers markets and rose societies often have different kinds of roses for sale as well. Make sure you purchase roses designated “Florida Rose Grade Label.” Look on the label and identify the rootstock. Buy ever-blooming grafted rose varieties on “Fortuniana” rootstocks. The Fortuniana rootstock produces a hardy root system and a strong plant with plentiful blooms. “Own root” or “multiflora” rootstock roses often only last one or two years before they begin to decline. Select a location on your property that receives at least six hours of direct sun every day. Roses are sun-lovers and will not thrive in shade. Amend the soil before planting the roses. Mix compost, peat, or manure into the soil throughout the bed. Rose roots spread; give them nutrient-rich soil to grow into. Dig a hole that is deep enough to comfortably accommodate the roots but shallow enough that the crown of the stem will sit just above the level of the soil. If it’s a rose that has been in a container, loosen any roots that have grown in a circle around the rootball. Fill the hole with amended soil, tamp it down firmly, and water. Water the plant regularly for at least two months until it has become established. Feed with rose fertilizer. (Feed year-round in south Florida and from February to November in central and north Florida). Prune roses once a year. Cut the canes back to ½ to 2/3 of their length. Less severe pruning may be done more regularly to maintain shape and remove diseased or dead canes.